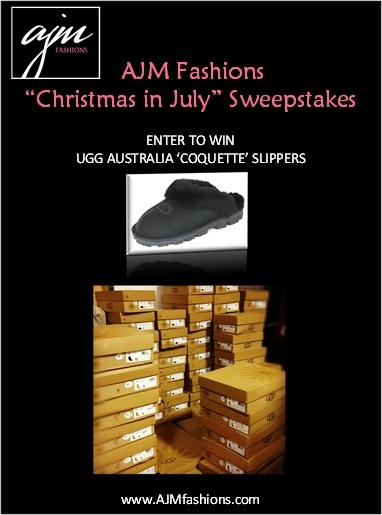 The ‘AJM Fashions Christmas in July Sweepstakes' will award one lucky person a pair of UGG® Australia Coquette Slippers. AJM Fashions (http://www.ajmfashions.com), the online boutique for designer fashion brands at discount prices, kicks off back to school and fall shopping with the “AJM Fashions Christmas in July Sweepstakes” on Facebook. Visit AJM Fashions on Facebook to enter and to sign up for the AJM Fashions newsletter to find out about special offers. To enter the “AJM Fashions Christmas in July Sweepstakes" go to http://www.facebook.com/AJMFashions. AJM Fashions (http://www.ajmfashions.com) is the online shopping destination featuring the hottest designer brands, cutting edge styles and fashion trends always at discount prices. From women’s and men’s apparel and shoes to coveted handbags, jewelry and accessories, AJM Fashions offers a unique and exclusive shopping experience to help you shop smarter and look more fabulous. AJM Fashions has been satisfying the most discerning designer bargain and style hunters since 1999. With new items in limited sizes and styles listed daily, savvy fashion hunters shop AJM Fashions regularly. To learn about our specials and exclusive deals, sign up for AJM Fashions Alerts and follow AJM Fashions on Facebook at http://www.facebook.com/AJMFashions.